Netflix shares are being "squeezed," and they look ready to resolve to the upside. Netflix ( NFLX - Get Report) shares are being "squeezed" and may be poised for a surge in price as volatility returns to the stock. In the last half of 2015, it experienced wide erratic swings in price, but that movement began moderating in the beginning of this year, and it has continued to the point where the contraction is nearing an inflection point. 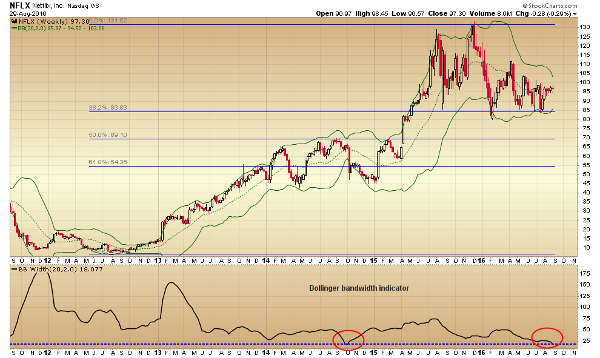 The recent consolidation is taking place just above the 38% Fibonacci retracement level of the 2012 low and the 2015 high, and the Bollinger bandwidth indicator reading at the bottom of the weekly chart reflects the intense percentage range contraction taking place. These periods of low volatility are often resolved by periods of high volatility, like the one that began in October 2014. A squeeze and then a surge above or below the outer bands is the signal that starts a new move. A daily ribbon chart further illustrates the compression by including a series of moving averages, with the 50-day average being the centerline and the shorter-term averages in green and the longer-term averages in red. The stock price this month has formed a small triangle pattern inside a larger four-month triangle and is positioned just above a braid of averages in the $93-to-$95 area. This band should act as a strong zone of support going forward. Moving average convergence/divergence, like the relative strength index, is flat but above its centerline, an indication of an upside bias in the direction of price momentum. Chaikin money flow is well into positive territory, and the money flow index, a volume-weighted relative strength measure, has moved above its centerline. 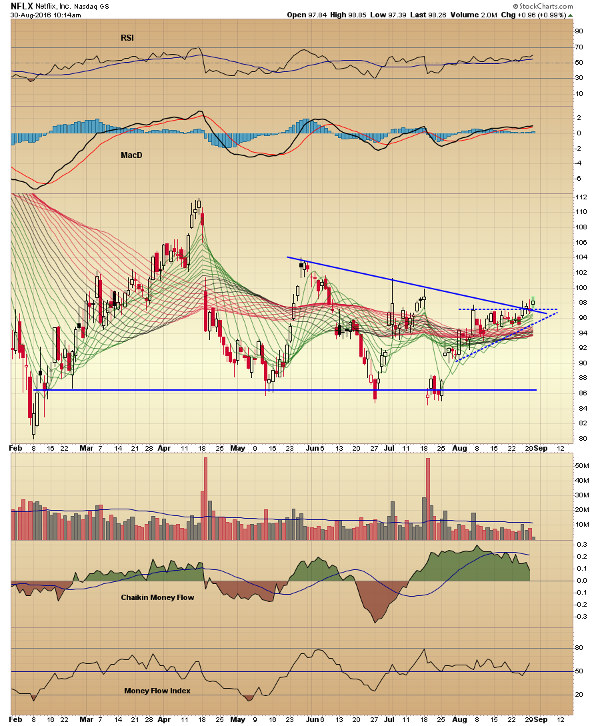 A close in upper candle range above the $93 level takes the stock above both triangle resistance lines and the upper Bollinger band and should be the catalyst for a volatile move higher. Head fakes are common with the volatility squeeze, so use a position size that allows for an initial stop under the zone of band support.